Meaning: very likeable, relaxed, not worried especially under pressure. Keep your cool means relax. 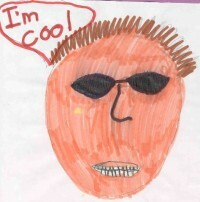 Example: He is a really cool movie star. I think he is a cool cat. I just love him. Keep your cool, that boy is going to ask you to dance.